Manchester United and Arsenal played out a rip-roaring draw as Jose Mourinho's men twice responded to freakish goals and secured a share of the spoils against Unai Emery's side. Neither Sir Alex Ferguson or Arsene Wenger were involved in the fixture for the first time since 1986, but the former was in the stands for an encounter as entertaining as some of the memorable clashes during their Premier League duopoly. 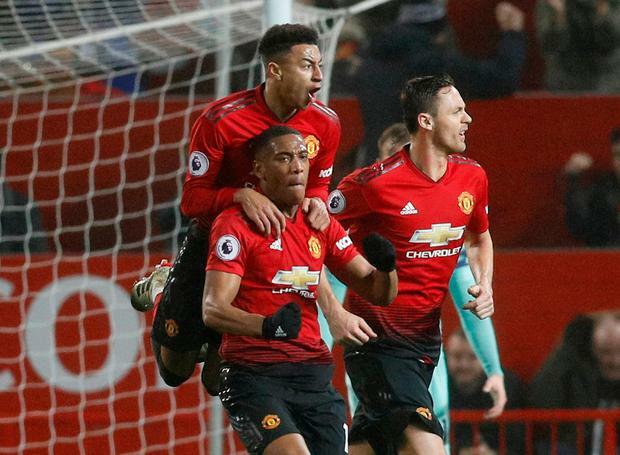 Anthony Martial levelled shortly after David De Gea's uncharacteristic mistake saw Shkodran Mustafi open the scoring in the first half at Old Trafford, where Jesse Lingard secured a 2-2 draw just 75 seconds after substitute Alexandre Lacazette squeezed Arsenal back into the lead. It was a frantic, and at times feisty, encounter at Old Trafford, which saw Emery's Arsenal rack up a 20th unbeaten game in all competitions as another winless league match leaves United off the pace in the top-four hunt. The Gunners, buoyed by their north London derby win, threatened to leave Old Trafford with all three points and went ahead after a De Gea mistake that raised as many eyebrows as Mourinho's decision to drop Paul Pogba and Romelu Lukaku to the bench. Martial, among the seven changes from the draw at Southampton, quickly levelled, but Arsenal went back ahead as a break ended with substitute Lacazette netting. But United hit back in a way that the watching Tyson Fury would be proud of, with Lingard capitalising on defensive confusion to turn home and set up a grandstand finish - one that would have brought an Arsenal win were it not for some stunning De Gea saves.